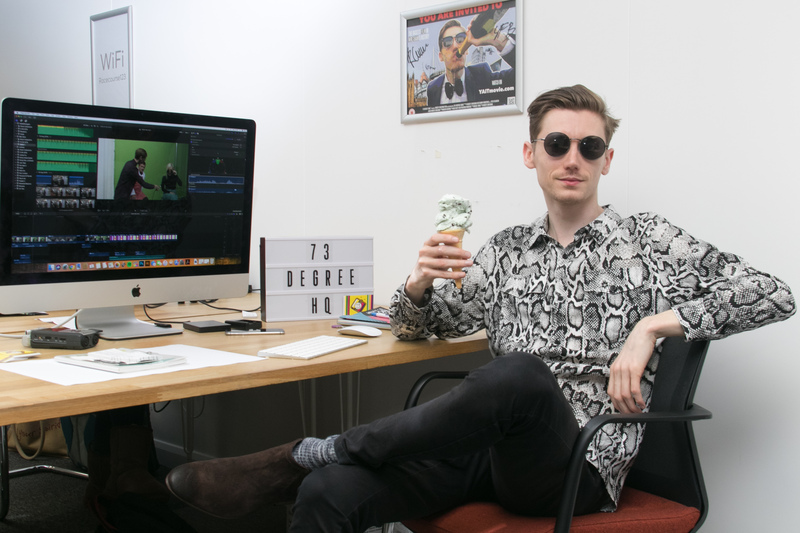 Founded by Robert Corcoran in 2014, 73 Degree Films is a film production company which develops and produces original content such as short films, web series, music videos and more. The company is based at the Wrexham Enterprise Hub and works internationally, shooting in Turkey, Austria and across the UK in the past few months alone. Recent projects include the 2018 web series ‘People in Places’ and stage show ‘Projekt Z’ (a collaboration with SignDance Collective). 73 Degree Films have collaborated and partnered with multiple international companies and have also created content for household names such as BBC Wales. As well as developing original content the company also has a distinct non-profit arm, focused on providing media training and experience. Rob’s passion for film started at an early age when he would write scripts and create films with his friends using his grandparents’ video camera. In 2012, whilst studying at Yale College, Rob had one of his scripts selected to be produced for a BBC Wales project. It was at that point when he realised film making could be a potential career path. He founded 73 Degree Films just 2 years later in 2014 whilst completing his Physics degree at the University of Liverpool. After moving back to Wrexham, he sought advice from Business Wales before officially incorporating 73 Degree Films in May 2017. Rob is particularly proud of “You Are Invited To” – a Wrexham-based comedy film that united 15 local businesses and over 30 local actors. Rob first got in touch with Business Wales to enquire about general business support and finance opportunities for his start-up. He received advisory support and attended a number of workshops, including Managing Your Finances and Tax and Bookkeeping. Following this, he signed up and completed the Business Wales 5-9 Club – a 12-week fully funded programme, designed to help entrepreneurs through the early stages of starting up, allowing them to get all the business support they need, fitted around their busy schedules. be organised: have a good calendar system in place and make sure it syncs up with all devices! try to have fun…that sounds good, right?